Holiday Book Sale! 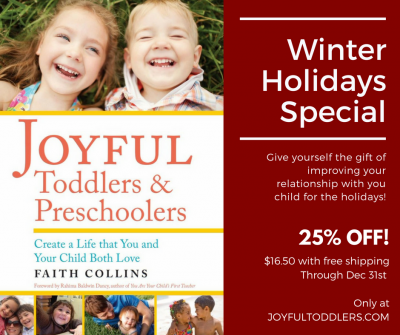 - Joyful Toddlers! For just three weeks, get 25% off, with free shipping in the continental U.S. Have you had your eye on my book but haven’t taken the plunge yet? Were you thinking of getting it as a gift for new parents you know? Now’s the time! Plus I’ll sign your book and am happy to personalize it if you wish. I am both humbled and thrilled with the reception the book is getting; it is truly making a difference in people’s lives. Please share the word about this sale, it will be done on January 1st. To learn more about the book (and details about the free shipping), click here.